Rusty Parrot Lodge is not available for online booking. Please submit an inquiry or call our agents to get pricing and availability information. 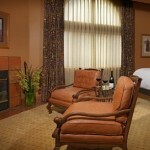 Single King Room- This room is perfect for a honeymoon or romantic getaway and includes a fireplace and whirlpool for two. There is one of the rooms on each floor. Single King Superior- This room is furnished the same as the King room with a fireplace but does not include the whirlpool. These rooms are located on the garden or upper levels. Single King Superior w/o Fireplace- This room is the same as above but does not include the fireplace or whirlpool. Double Queen Superior- This rooms appearance is the same as the previous but furnished with two Queen beds and can therefore accommodate up to 4 people. 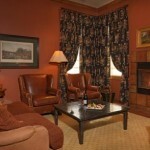 Owner's Suite- In this luxurious suite the living and bedroom areas are separated and each room has its own fireplace. 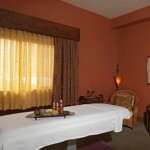 It has a large walk- in closet, safe, whirlpool tub for two, walk-in shower and dry bar with refrigerator. 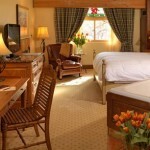 The adjoining bedroom includes two queen beds making this suite perfect for a family of four. The Wild Sage- This menu incorporates local ingredients and flavors in a creative manner. 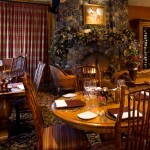 The dining room seats 32 people with a beautiful river rock fireplace, and a full view exhibition style kitchen. The Wild Sage offers a carefully chosen extensive wine list, organically grown produce, local game and meats, sustainable fish and other seafood and freshly prepared desserts. 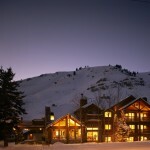 It has been awarded the AAA Four Diamond award for 19 consecutive years and the wine spectator "Award of Excellence" and has been recognized as one of the best restaurants in the Intermountain West as well as a few other prestigious awards. The Rusty Parrot Cookbook has some of the favorite recipes as well. A 50% deposit is required at time of booking; the remaining 50% will be automatically charged 14 days prior to arrival. Reservations made within 14 days of arrival will be charged in full. All cancellations will be charged a $35.00 handling fee. Reservations canceled more than 14 days before scheduled arrival will receive a refund of deposit. Reservations canceled within 14 days of arrival date are nonrefundable. We love animals and while they are not allowed in the lodge, we would be more than happy to arrange boarding while you are with us. The charge for animals in the room is $500. Service animals are of course allowed. Room rates based upon double occupancy. 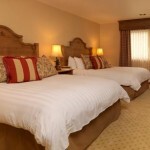 Additional person is $20.00/night. Rooms with two beds are limited to four people. There is not room for a roll away in these rooms. Some rooms with one bed can accommodate three with a roll away. Please call for availability rather than booking on line. 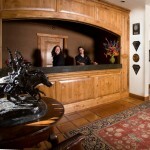 Front Desk hours are 7:00 a.m. to 11:00 p.m. Please make arrangements with the Front Desk at (307)733-2000 to check in or check out before or after these times.